Flying from the Boston area to our neck of the woods is never easy. Other than Jet Blue (whose prices tend to eliminate them from contention) no other carrier flies nonstop from Boston to Austin. Flights to and from San Antonio aren’t much better. . .so the flight today went from Boston to Detroit and from Detroit to Austin. Yeah, kind of convoluted but it worked and just in time! It seems that the President is coming to Austin tomorrow (Thursday) and about the time she came in today is the time he is scheduled to depart tomorrow. Talk about a potential traffic headache! Thank goodness it’s a headache we won’t be dealing with at this time tomorrow!! So, even though the flight home requires a stop–be it Detroit, Charlotte, New York, Dallas–the end result is she’s home. . .and we are happy! On a different note, we decided to break open a wine that we didn’t expect to like. . .a very young 2012 Yellow Tail Pinot Grigio from the Cassella Family Vineyard in Australia–a prize won at a recent Gala that we attended. From our perspective, white wines are — well — they are just there to us. Nothing more…nothing less. So we had very low expectations about this very commercial wine. Almost a third of the grapes used for yellow tail are grown right in the Casella family’s own vineyards–almost 540 acres of vines in the Riverina region of Australia. Following the great Australian wine-making tradition, Casella also sources fruit from other superb growing areas throughout South Eastern Australia. 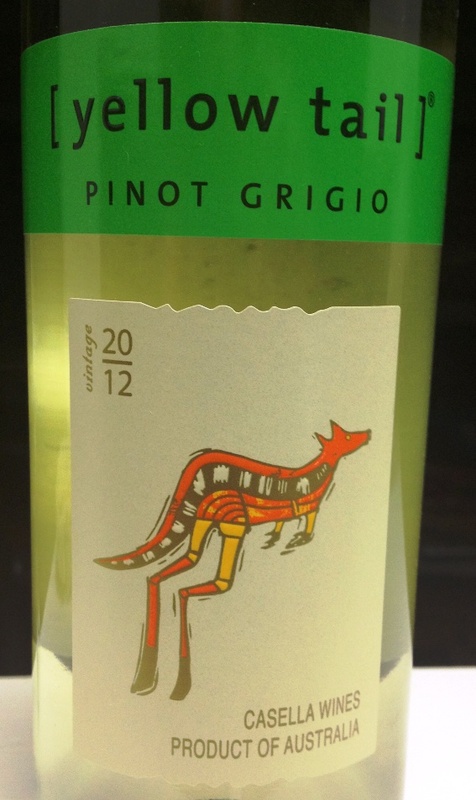 This Pinot Grigio displays aromas of passion fruit and lime, with upfront fruit and a crisp, clean and refreshing palate. Surprisingly crisp, the wine doesn’t have that overly-alcohol flavor that some highly commercial wines have. All in all, a decent wine to enjoy on hot summer days or with spicy foods any time of year. Is it a wine for us? Probably not…no offense to the folks at Yellow Tail, but this isn’t a varietal or production wine that appeals to us. Yes, there are those who ‘swear’ by this stuff and more power to ’em, but we aren’t part of the plan! Make no bones about it, we’d much rather savor a big red wine like ‘E’ from Locations over a commercial white, but that’s just us. If you like white wines and want to try something that has some fruitiness for less than $8 a bottle, then by all means go for the Yellow Tail. . .as for us, we’ll try something else, thank you! And—if you have a graduate in your family this year, our hats are off to them and YOU! It’s a special accomplishment in the life of a young person–be it high school or college. As you toast your grad, remember to enjoy it responsibly and recycle whenever possible. Categories: Uncategorized | Tags: yellow tail | Permalink. Wow, a white AND a yellow tail! Must be slim wine pickings at Casa de Vino!